Mallikarjun School, Pithoragarh has released notification for the recruitment of Principal & PET purely on the basis of performance in interview. 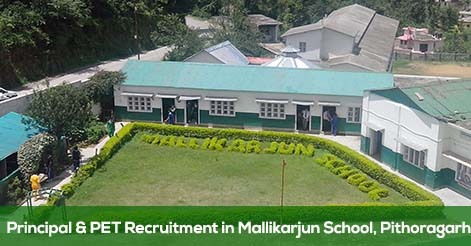 Mallikarjun School, Pithoragarh will conduct walk-in interviews of the shortlisted candidates. The selection of candidates will be done on the basis of performance in the in interview. Interested and willing candidates send their resume on our email address mallikarjunschoolpth@rediffmail.com or they can send their resume by post. On the basis of their qualification candidates will be called for interview. Help us to improve this article/job posting "Principal & PET Recruitment in Mallikarjun School, Pithoragarh". We would be glad if you can comment below and provide your valuable suggestions and feedback. If this page have any wrong information/list or out of context content, then you can report us as well. IAM searching job for the post of physical education teacher (pet) in Pithoragarh .IAM presently working in CBSE school last 11 years.